M&M'S released today a short online video revealing that Danny DeVito will star in the brand's new Super Bowl LII commercial. 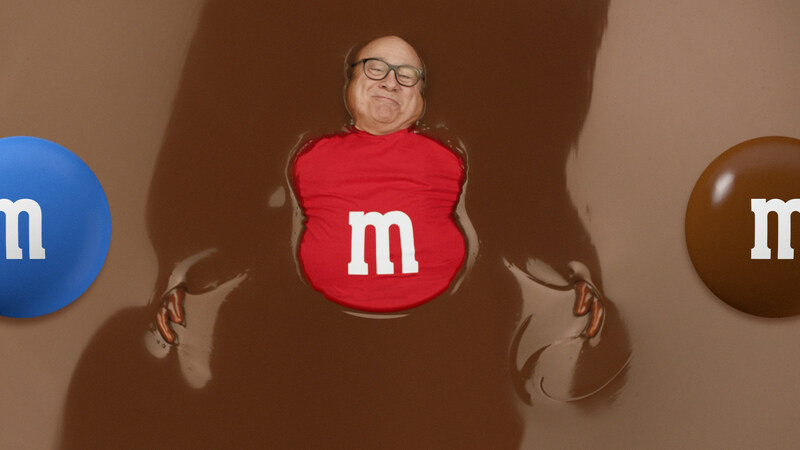 To give America a taste of what's to come on Super Bowl Sunday, DeVito is shown humorously lounging in a pool of chocolate. This teaser video, which was created by BBDO New York, nods to one of the most iconic visuals consistently found in M&M'S advertising. For many years, M&M'S commercials end by featuring the iconic red M&M'S lentil rising up through a pool of liquid chocolate. This time, it's DeVito in place of the M&M'S lentil to pique fans' interest in the upcoming full-length Super Bowl LII spot. "When M&M'S approached me about starring in their Super Bowl commercial, I quickly jumped on the opportunity to partner with such an iconic brand," said DeVito. "Plus, who can resist seeing me in a giant pool of chocolate?!" The all-new 30-second commercial starring DeVito will air during the first quarter of Super Bowl LII on Sunday, Feb. 4, on NBC. The spot will also feature a special guest appearance by YouTube star, actor and singer Todrick Hall. "Much like M&M'S, Danny DeVito knows how to entertain," says Allison Miazga-Bedrick, Brand Director, M&M'S. "We felt that Danny DeVito brought the perfect amount of humor needed for this year's Super Bowl spot, and we know our fans will be delighted to see how he interacts with some of our beloved spokescandies." The M&M'S Brand has already been building excitement for the upcoming release of its new Super Bowl LII commercial. Earlier this month, M&M'S launched a contest across the brand's social media channels asking fans to submit their best touchdown dance featuring M&M'S for a chance to win custom prizes. The brand also previewed the new commercial with a handful of film critics and captured their reactions [link] to share during the Critics' Choice Awards Red Carpet Show, which aired across CW properties on Thursday, Jan. 11. Additionally, the new teaser video starring DeVito will air once on TV during the Super Bowl LII pre-game show on NBC.